Luca comes back, revealing to the crew she got lost vacationing when the impostor android took over while hiding the fact Ririka helped her. The space pirates, gathering at the main dining hall, are startled upon Quartz's appearance. However, the head chef allows her here because she is a pirate endorsed by the Galactic Empire. To settle things, Marika challenges Quartz to a duel where the space pirates will battle against her forces which the latter agrees. Before a hotheaded captain starts causing trouble, Ironbeard intervenes, who is under orders from the Empress of the Empire to retrieve Quartz. Come dinnertime, Ironbeard and Quartz are soon confronted the hotheaded captain, only to be subdued by Ririka. Misa arrives, learning that Kane had switched places with his twin brother, Shane McDougal, helsman of the Parabellum crew. Ironbeard wishes to know if the space pirates in this region will either become true pirates or privateers. 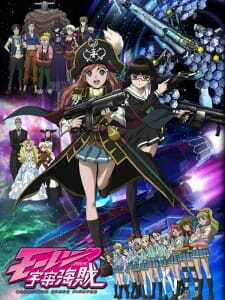 With Bentenmaru repaired and upgraded, Marika is chosen to become the leader of the entire forces of the space pirates and is to lead them to their destination for their duel with the Grand Cross.